Please be kind this is my first write up. I apologise if I miss anything or get things slightly wrong. After a long week Friday finally arrived and just a morning to get through at work before leaving to head to Derbyshire. Well finally I was on the bike heading towards a county I’ve not experienced before. A very uneventful ride over to say least which in my eyes is always a good one compared with past history. Leaving Leek I was introduced to Englands very own police state. Finding nearly every road a 50mph limit. This surely couldn’t be true. But heading on the A53 towards Buxton I came to the decision they have done this so you can take your time and admire the beauty that is around you. Definitely a welcome to Derbyshire. As I neared to castleton I was then introduced to a lovely little winding road that took me along Winnatts road. Down through a small gorge in the rocks which can really be compared to the likes of Cheddar on a smaller scale. Well this set me in a good mood for what was to come over the weekend. I arrived at the Cheshire Mews B&B to find I was the first one to arrive for the weekend. And quickly got checked in and bags removed from the bike. I decided to go and get fuel ready for morning as I hadn’t passed a fuel stop for a while before arriving so headed back out on bike to Bamford to fill up. Nick and Ellie had arrived when I returned only for them to say they had just seen me riding off to get fuel. I had the first look at the new brightly coloured z1000 of nicks. Certainly became a Marmite bike…. Love it or hate it. But it does grow on you. Colour not so much. Would be more fitting in a sci-fi film. Over the next few days we all had the experience of tripping over a small railing around the car park. Even YZFJohn after telling me to be careful turned round and tripped over it himself. A very strange discussion of why would there be a catflap in the one door at the B&B. Which happened to be my room. 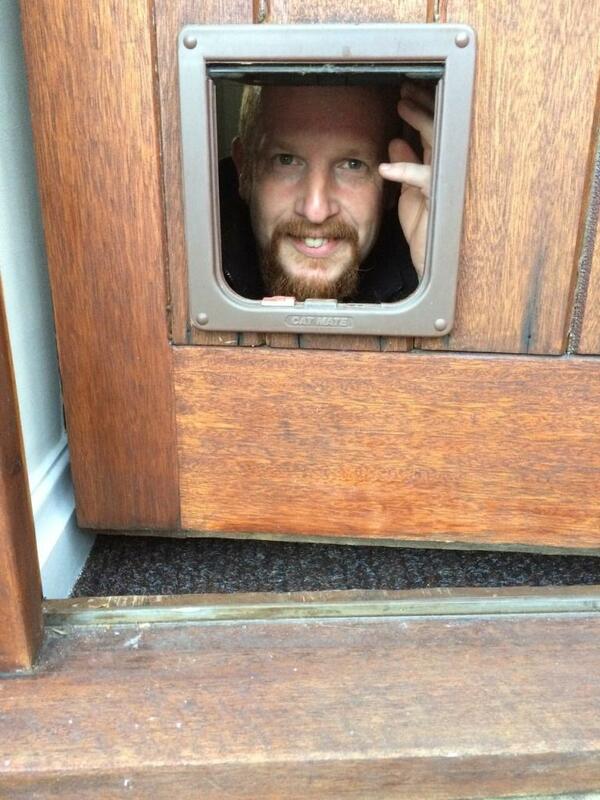 So of course what do you do when you see a small door in your bedroom door…. You have to look through it don’t you…. And we hadn’t even drank anything at this point. We headed over to the Cheshire Cheese inn over the road to sit down with a pint and await others for dinner. After getting the first round in and discovering a wonderful pint of beer called moonshine we were joined by ‘oldcat’ and wife Bea. ZFRJohn was running late and would join us there later on. A few more drinks later and a lovely meal was had. During desert John arrived and upon taking a bit of pity over him missing dinner I shared my desert with him. A few too many pints later we headed back to our rooms to get a good nights sleep ready for morning. A cold and misty morning and breakfast back at Cheshire cheese inn. Although feeling a little rough I avoided the light salad had by Nick and John. A few more bikes then arrived. Dogsbody, Prime and Robcat with linz. This was only a small group, but for Ellies first leading ride out I think she was quite happy. With Greencat and Kwakcat meeting us later at the lunch stop we were all set to head out. Heading out of Castleton waving to Oldcat and Be who were sat waving outside there B&B The Bulls Head. We headed back up the gorge road I had ridden the evening before and soon after we soon came to our first incident of the day. The road ahead was blocked full of traffic. A quick decision was made to turn round and head back. A very patient HGV Driver sat while we all turned round in front of his truck but I think we soon used up his patience when we all pulled over to the side of the road to regroup. With frantic waving of arms we got out of his way and headed back to Castleton to find an alternative route round. As we passed the Bulls Head again oldcat and b were just leaving in their car and I’m sure they were wondering what on earth we were up to. Turning in the town and heading up a narrow winding road we soon realised why it was so busy. A bike race/competition soon saw us heading into lots of oncoming cyclists who seemed to think they owned the road. Despite lack of road tax on the bikes. We were soon back on course and making our way to first pit stop of the day. Travelling over some beautiful hills and surrounding countryside. Passing through Bakewell my mind soon starting thinking of food. Wanting to stop for a real Bakewell tart. But no onward. We travelled through the surrounding grounds of a stunningly beautiful Chatsworth House and soon we were heading into CMC motorbikes of Clay Cross. 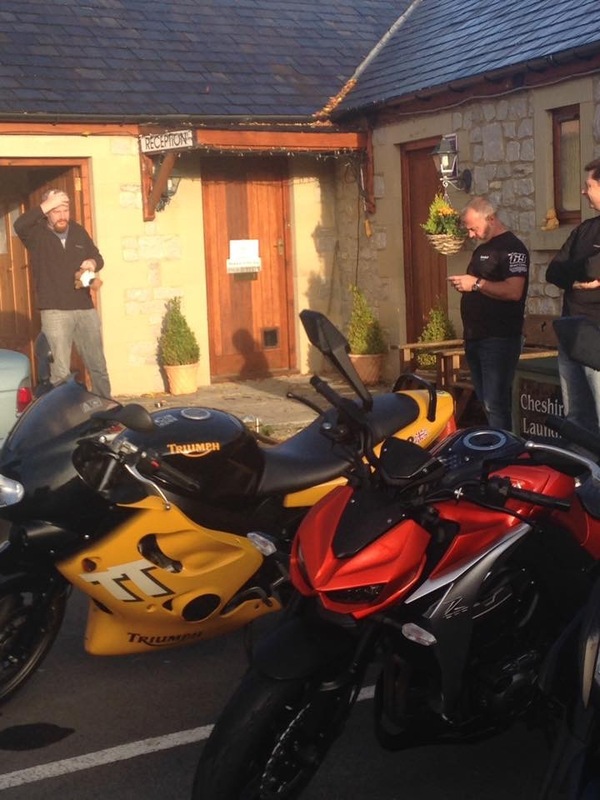 We parked up and headed into an amazing bike showroom and café where the discussions of how everyone had gotten on soon started. 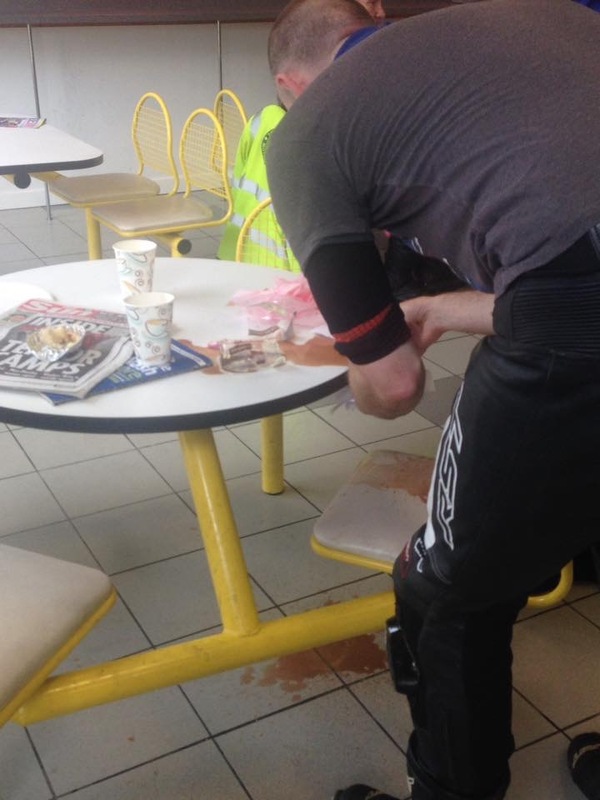 Prime soon started to show his true colours for the day and ended up spilling his drink all over the table and floor….. Not a good start to the day. After browsing and dreaming around the new bikes we headed back out again. This time towards New Ollerton which was to be our Scheduled dinner break for the day. This time having some town driving heading out of Chesterfield and surrounding villages. A good thing of small group rides we don’t get spread out quite so much so we were all together most of the way. But still we were using the junction marking system and it worked very well even with a small group. 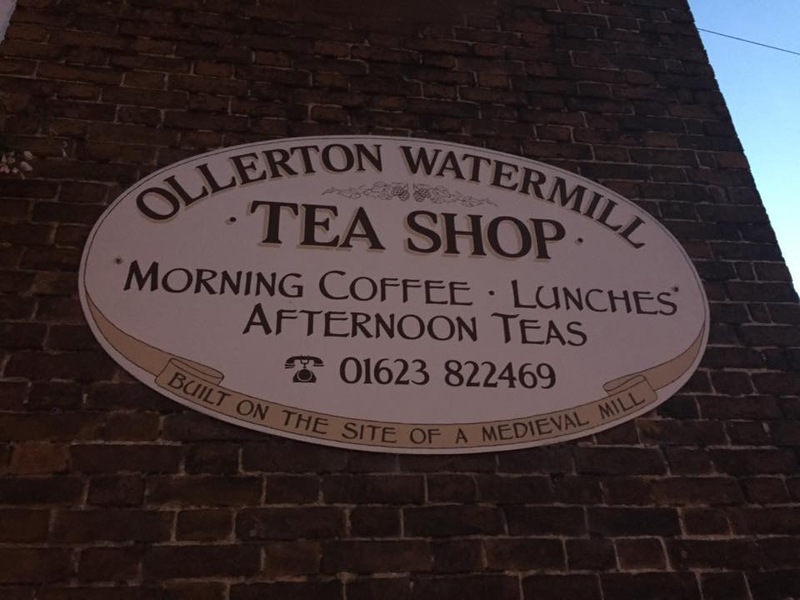 We were soon at New Ollerton a lovely picturesque setting by the river.. We were booked into an old water mill café set in the upstairs of the mill with the waterwheel still underneath. As we entered I think the Purple Rinse Brigade that were already seated enjoying the cream teas were feeling rather worried as a bunch of bikers came in and sat down in the corner. Raising the volume of the room. Kwakcat and Greencat soon arrived after we had sat down. Good timing. And soon we were ordering..
At this point I think that the impression most of the other customers got of us soon changed as many of us were ordering tea and soups and even good old Prime ordered his Cream Tea, with Scone and Clotted cream. The one other family in the room with 2 young children were so excited we were there and wanted to go and see our bikes. Much to there amusement when they saw TT Teddy sitting on the back of my Triumph TT600. After queuing for the toilets much to the disgust of one lady who was stood outside the ladies when who should come out but our very own robertcaines. A perfect photo opportunity but lurking around toilets with a camera is surely frowned upon. Back on the bikes we soon headed out into the countryside again towards worksop. Passing by a favourite of mine clumber park,. We headed back towards the Derbyshire dales again and planning on a stop at Ladybower Reservoir. Again a great selection of roads. Offering both bends, straights, fast bits and slow controlled sections. We said good bye to dogsbody on his thundercat along this stretch. We stopped along the dam wall at Ladybower for a few photos and a regroup. Everyone stood chatting and along came past us a police speed camera van. Hopefully last time we would see him for the day. Greencat having a wardrobe malfunction when his zipper tag busted off his much loved leather jacket. Anyone got any scissors…we’ll see when we get to coffee stop. Here we said goodbye to Kwakcat. as we travelled a short while around the reservoir to a roadside café for a coffee break. A quick fix for greencat using a keyring loop had him free. We were soon hearing about Primes recent accident up on Snake pass which we were heading towards. Poor lad. Back to it again and over the amazing road of Snake pass. By this time the clouds had lowered and a fine mist was in the air. 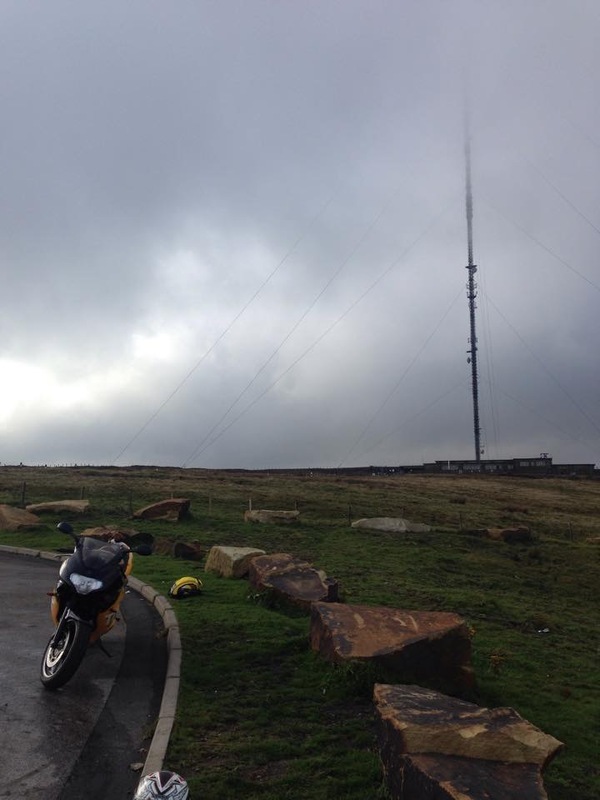 But didn’t dampen the riding spirit as we rode over the pass and on towards Glossop. YZFJohn was obviously looking forwards to his dinner and wanted Pheasant as he had a near miss with a flying bird crossing the road. A busy road but with great corners and bends we were soon heading down towards Glossop. Here a fuel stop soon saw us saying good bye to Greencat and Robcat with Linz. They all headed home as we headed up towards Holmfirth and over yet another wonderfull mountain pass. But a quick pull over to the side of the road happened before we left Glossop due to some particular leader forgetting to fasten helmet. (Numpty Point). A great tune was played on the bike horns while we waited. On and up we went. With writing all over the roads a remnance from the Tour De France we were soon twisting and turning over a great road. At the other side of the pass we were soon turning around and heading back up to the car park at the top for a great photo opportunity…. One particular tight bend saw Prime experimenting with off roading and myself who at this point was at the back of the 5 bikes come round a corner to see Chris edging backwards off the embankment and pull in behind me. (Numpty Point). He was ok a mechanical error and bad timing was the cause. At the car park the usual line up of bikes and discussions lead to a great number of ways to make amusing photos. Jumping up and down on rocks. Selfies, disabled poses on the floor. And some lovely scenery photos were taken. Robertcaines upon looking at his phone wondered how on earth he had a 4G signal on his phone…. Something to do with the 40ft antennae on the mountain behind him was pointed out to him. (doh). We soon said good bye to Prime at this point as he was heading back home in the opposite direction. We got ourselves sorted ready to leave when to my horror. Turning ignition on. Nothing. Dead. God no not up here please……check cables, kill switch. Nick, John Help. What have I done. Luckily it was only a loose connection on battery… soon fixed and we were back on the road heading back a slightly quicker way to Castleton. Down to 4 bikes now…. There were a few idiots on the road on that stretch. One particular Peugeot driver not happy at being stuck behind a landrover and trailer especially when we flew past…. He decided to make nicks life a bit harder…. Soon we were nearing Castleton turning left to head down the Gorge road into the town. Only a 100 yards we soon saw Ellie tapping here helmet and shaking her head to signify It was the next road we needed not this one. Quick turn around and we were back on route admiring the gorge for the last time that day. Avoiding the sheep and cyclist and walkers which there were plenty of. Back to base. Quick debrief and time for a chill out before heading to dinner. Nah scrub that. Beer time saw myself and nick sitting outside Cheshire cheese inn watching the locals go by. Ellie and john soon joined us and we were heading on a mini pub crawl to the nags head for a pint. Or a novelty a round of 3rds. 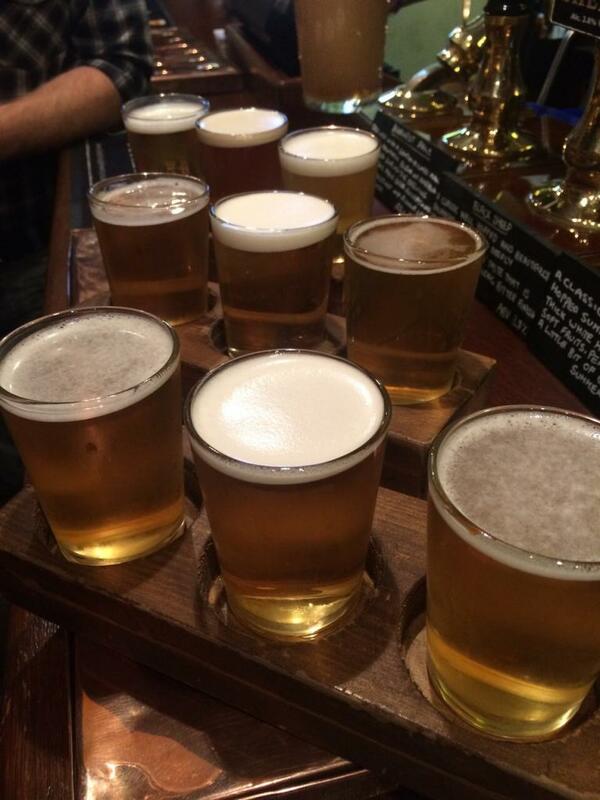 3 number 1/3 of a pint glasses of any beer you choose. A great idea. Then onto our evenings venue of the Bulls head. Where we met up with Oldcat and Be. And soon we were joined by Robcat and linz who had brought with them their entertaining little one Euan. He brought a smile to everyone all evening. A great meal with some great conversation and recaps of a lovely days riding. Beers were drunk rather too quickly I think and our numbers soon dwindled. I was introduced to a new beer. ‘Old Tom’ at a wopping 8.5% it was a struggle at that time of night lol. Everyone having headed off to bed me and nick soon thought it was time to head back ourselves although the idea of one more pint is always alluring. Back into the nags head where we managed to persuade the landlord to serve us. After putting the world to rights and a proper catch up with my old mate. It was time to head back to the B&B. A really great day over with. Soon we parted company and I was on my way home. I think upon reflection that this can be classed as a real success and congratulation to Ellie on organising a fantastic weekend or riding and socialising. Heres to next year and Devils Arse 2. Im in. Brilliant write up Mark, thank you. Pity about the very first road being blocked by an accident but that's life! Really enjoyed it, thanks everyone and I now have every sympathy and understanding for the other rideout organisers! Great write-up Mark. Thanks for that! Great review there TT, really wish that I could of joined you all. Good to see the salads get a mention!! Run this next year and I will do my best to come out to play. Could be one for the Ducati. Great write up Mark, was nice to see the bend again where my Cat met it's demise, although the weather was significantly better this time. Have Managed to get a Video up on YouTube of the Snake Pass Section, (Kamakazi Pheasant at 10:36 in). Somehow managed to upload this video at 1080HD which is not the right setting since I recorded in 720HD. Will endeavour to get more up in the coming week. Humour : Gradually Leaving me. Sounds like a great weekend, gutted I missed it but hey ho there's always next year!! It is good to still see the odd Thundercat on these rideouts. Great write up. Never had you down as a pheasant plucker John.....but you so nearly were. Nicely timed duck though! I like the fact that when you had a problem with your bike, it was the men you turned too lol. 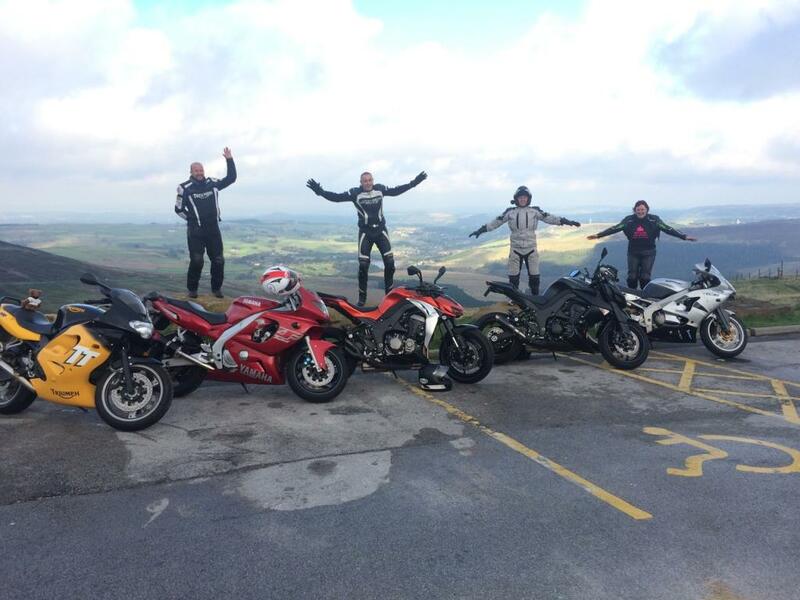 Devils Arse Review - Video Added. Another video, this time it's from the Glossop fuel stop and heading up towards Holmfirth. Unfortunately the battery went dead before we reached to top. If you wonder why we pulled over not long after starting, its because Ellie forgot to do her helmet up! #numptypoint? Excellent John (apart from spelling my name wrong lol) pity we didn't get the next bit as its a cracking road. 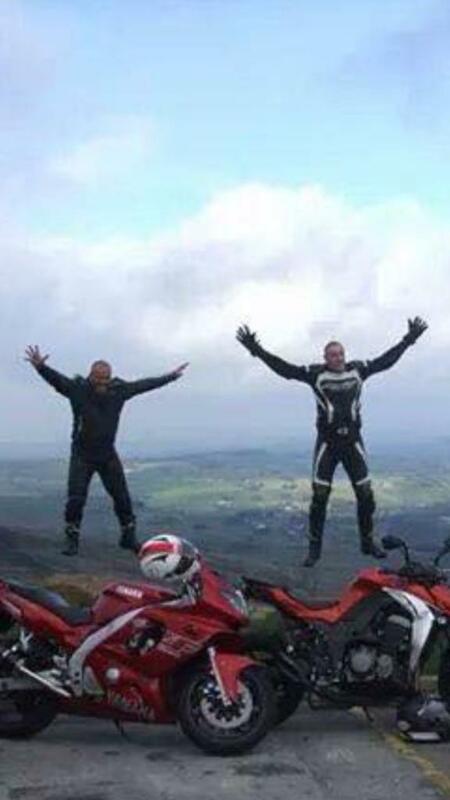 OK, here's another Video from the Devils Arse rideout (only one more left). I did this one on the way home. We left Catleton and went through the lovely Speedwell Gorge which is where the Cavern is located. After that we went back down again and through Castleton stopping at a fuel stop (where this video ends and the next one begins) on the way to Chesterfield. great write up mark...well done Ellie , sounds like a great weekend, just sad we could nt make it this time, but will definitely be there next year.